JustaBXgirl loves a good playset. And I love watching her imagination come alive as she builds brand new worlds where My Little Pony and Peppa Pig might meet. She creates worlds where Shopkins and Hatchimals attend the same Superhero High Academy amongst so many toy mashups that I never pass up the opportunity to add new playsets to her collection. Here are a few of the latest ones we’re going to be adding to our collection this holiday season. Which would your littles love? 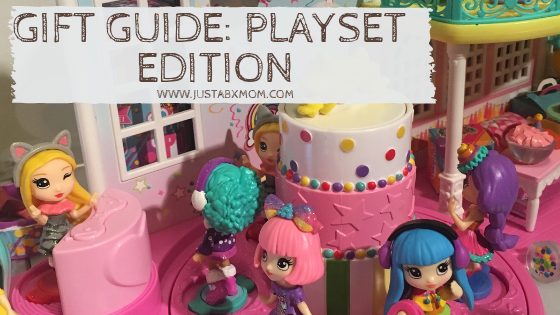 Party Popteenies Playset – Have your littles started collecting Party Popteenies? We’ve been sharing them as a new favorite since we first saw them. Unboxing one is like unboxing a party, complete with confetti. Now they’re adding a playset to the mix and we are here for it! I love that the packaging becomes part of the fun. And there is so much fun to have. I mean, it is a party after all. There are plenty of surprises to uncover, including a dance floor because every party needs a dance floor! Sunny Bunnies Bunny Blast – I wasn’t familiar with Sunny Bunnies before getting this playset but just seeing the cuteness made me a quick fan. I mean, look at this! I love the colors and see us having lots of fun seeing who we can blast out of the cannon. The set comes with all five of the Sunny Bunnies and will lead to hours of fun. Hatchimals Colleggtibles Crystal Canyon Secret Scene Playset – You’ve probably seen this in the background of some of JustaBXgirl’s photos. She has been obsessed with it since she got it. She likes to pretend that it is a magic egg that she has to find a way to unlock. When she does “unlock it” she discovers a wold living inside. Tonka Real Tough – Construction Site Carrying Case – It is now our goal to collect as many Tinys as we can so we can fill all of the open spaces in this carying case playset. Here’s another I love for the versatility. It is not only perfect for storing your cars but becomes part of the play as wel. While I’m not a fan of taking tiny toys on the go this keeps them together so they won’t get lost! Calico Critters Town Designer Studio – Do you remember when we got to attend the Calico Critters Tea Party a few weeks ago? This was in our gift bags!!! Let me tell you that the Designer Studio has had so many clients since we took it out of the packaging. JustaBXgirl has even hosted a few pajama parties there hosted by Stella. SmartMax My First Tractor Set – I thought this playset was a little young for JustaBXgirl when it arrived but the moment that I said we would send it to her godsister to check out she hugged the box and asked if she could please keep it! It comes with 22 pieces and is fun to put together. One other great thing is that this set is compatible with all other SmartMax sets.